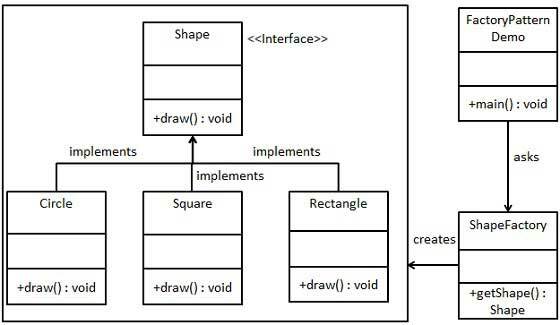 Factory pattern is one of the most used design patterns in Java. This type of design pattern comes under creational pattern as this pattern provides one of the best ways to create an object. We're going to create a Shape interface and concrete classes implementing the Shape interface. A factory class ShapeFactory is defined as a next step. FactoryPatternDemo, our demo class will use ShapeFactory to get a Shapeobject. It will pass information (CIRCLE / RECTANGLE / SQUARE) to ShapeFactory to get the type of object it needs. Create a Factory to generate object of concrete class based on given information. Use the Factory to get object of concrete class by passing an information such as type. //get an object of Square and call its draw method.